Blinky bits. Shiny things. Squirrel. Good news guys! I’m back(ish) and I’ve got a brand new fundraiser with me. I’m modeling it off the mystery box craze and it’s your chance to maybe get some Amanda related goodies. I’m really excited about this fundraiser (aren’t I always?). You can find all of the information here on the fundraiser page. It’s only running for one month, so we need to spread the word quickly. 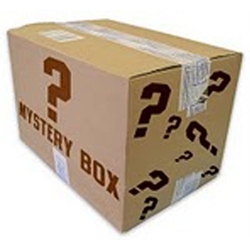 If you’re not familiar with the Mystery Box concept, it’s pretty simple. You buy (or, in this case, donate for the chance to win) a box full of stuff and you have no idea what’s in it. Unlike the usual mystery box, in this case, you can guarantee that you will be getting a box of things related to Amanda in some way. Whether it be a Stargate water bottle, a rubber duck (Space Milkshake), book/movie, etc. If you have any questions you can contact me at amandatappingonline@gmail.com, on twitter (@ATOnline) or on facebook and I’ll do my best to answer. Sorry for the delay in posting this, life sort of got away from me. The new holiday fundraiser is live. You can find the store front here. You’ll notice there’s three shirts instead of the two I said there’d be. There were a couple ties in voting so an extra shirt made the cut. Since production for shirts is expensive, I’ve had to use a website. The shirts are available in various sizes, types and occasionally color. This is a tad different than what I usually do because, unfortunately, the website automatically charges a fee for production costs, but 100% of the proceeds will be going to Sanctuary for Kids. The website I chose will only make the shirts if the set minimum order has been reached. I have the minimum currently set as low as I can so all shirts should be printed. Head on over to my storefront and take a look at all the shirts available. If you have any questions I’m available on twitter as AT Online, on facebook and through email. The second part of the fundraiser is an addition to something some of you may remember. During the fundraiser in Chicago we made a special Cards Against the Goa’uld game (photo). This year a few people mentioned expansion packs and you know how I run with ideas. This holiday season, you have the option of getting a Christmas expansion pack for Cards Against the Goa’uld. With a $10 minimum donation to Sanctuary for Kids, you’ll receive the PDF file to download and make your own cards. As with fundraisers in the past, just send a copy of your receipt to amandatappingonline@gmail.com and I’ll email you your expansion pack. Some of you may remember these shirts from last years fundraiser in Chicago. I’ve decided to bring back two shirts for purchase just in time for the holiday season. They’ll make great presents for you or your favorite fan. Just like before, the chosen shirts will only be available for a limited time. Since production for shirts is expensive, I’ve had to use a website. The shirts are available in various sizes, types and occasionally color. This is a tad different than what I usually do because, unfortunately, the website automatically charges a fee for production costs, but 100% of the proceeds will be going to Sanctuary for Kids. The website I chose will only make the shirts if the set minimum order has been reached. 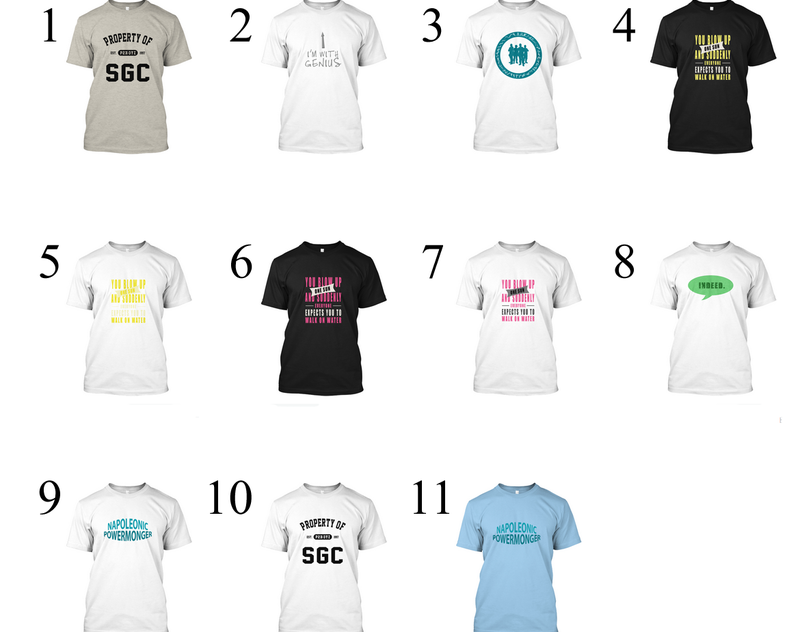 That is why I’m only going to reactive the two shirts with the most votes below. Voting will close on October 31st. If you have any questions I’m available on twitter as AT Online, on facebook and through email. The last fundraiser we did was held the last night of the Stargate Chicago Con in August and combined with the online portion, raised an amazing amount of money for Sanctuary for Kids. This was in large part due to Paula’s generous donation of props for an auction. A few of you might be aware that the reason we decided to do a live in-person event was that it was suppose to be the last Stargate convention. Obviously that wasn’t the case as there’s going to be another one this year. We were very much on the fence about attending again but with the recent announcement that Amanda was booked as a guest, I can’t even begin to tell you how quickly two tickets were bought. This of course led to a bunch of hemming and hawing about another event. Do we? Don’t we? What if no one shows up? Pretty much everything that went through our minds last time. The only thing we have on our side (besides you guys) is that this won’t be our first time anymore. We learned a lot last time, including the fact that the auction of props is what made it such a huge success. That being said, I’m going to be completely honest. We’ve decided that we’d hold another fundraiser like last year if we could collect some props to auction off. They don’t have to be Stargate/Amanda related, in fact the item which caused the biggest bidding war (and resulted in me having to watch Farscape) was a picture autographed by the entire cast of Farscape. If anyone has anything they’d like to donate as an auction item, we’d be eternally grateful. You have a few months to think about it but know that if you do decide you have anything you’d like to donate (whether you’re attending or not) we’d make sure that it wouldn’t go for anything less than what you think it should. If you have any questions or want to get in contact with me, send an email to amandatappingonline@gmail.com and I’ll get back to you as soon as I can.